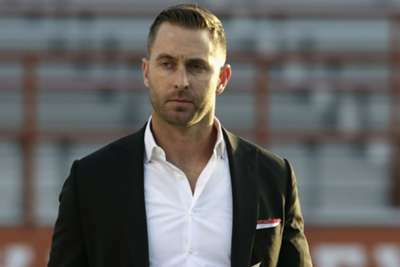 Arizona Cardinals head coach Kliff Kingsbury is open to exploring all his options around the number one pick in the NFL Draft. The likely option is Kyler Murray, but Kingsbury said "everything's on the table". "When you have that first pick, you've gotta turn over every stone and look at every scenario that's out there, and so we're definitely doing that," Kingsbury said, via NFL.com. The first-year coach added: "We haven't [decided what to do]. We haven't. We're a long ways from that. You know, coaches on the road, scouts from the road, private workouts, pro days. And we won't even discuss until next week and try to fill our board and go from there." Murray, Kingsbury and general manager Steve Keim reportedly had a private meeting this month. But, Arizona have been clear in their efforts to stick with starting quarterback Josh Rosen. Rosen, 22, was selected by the Cardinals with the 10th overall pick in the 2018 draft. He finished his rookie campaign with 2,278 yards passing with 11 touchdowns and 14 interceptions in 14 games (13 starts). But, Arizona went 3-10 with Rosen under center. Murray, 21, won the Heisman Trophy last season at Oklahoma after throwing for 4,361 yards and 42 touchdowns while rushing for 1,001 yards and another 12 scores for the Sooners.